This post is brought to you by Newman’s Own. After a few glorious days of sunshine and sleeveless-shirt weather, it snowed again yesterday. 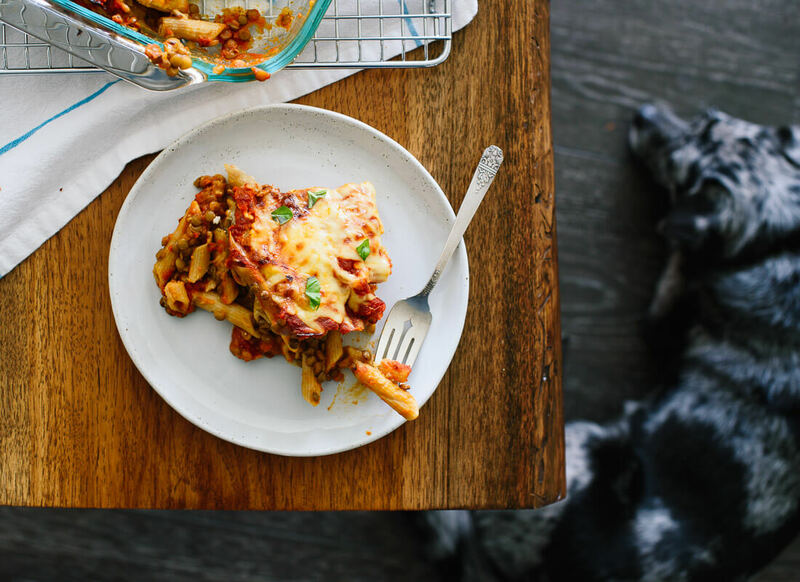 This baked ziti is precisely what I want to eat when it’s cold outside. Hearty, saucy, cheesy pasta with redeeming whole grains and protein-rich lentils to keep me fueled for hours. This dish is in sharp contrast to the pasta dinners I loved as a kid, which consisted only of refined carbohydrates and loads of sugar-laden marinara sauce. No matter how saucy pasta I could slurp down, I was always hungry 30 minutes later. No wonder! I quickly lose my patience with recipes that require stovetop preparation followed by a long bake, but I kept this one as simple as possible. It’s worth the [minimal] effort and the wait, I promise. One way that I simplified the recipe—without sacrificing health factors or quality—was by using store-bought marinara sauce. 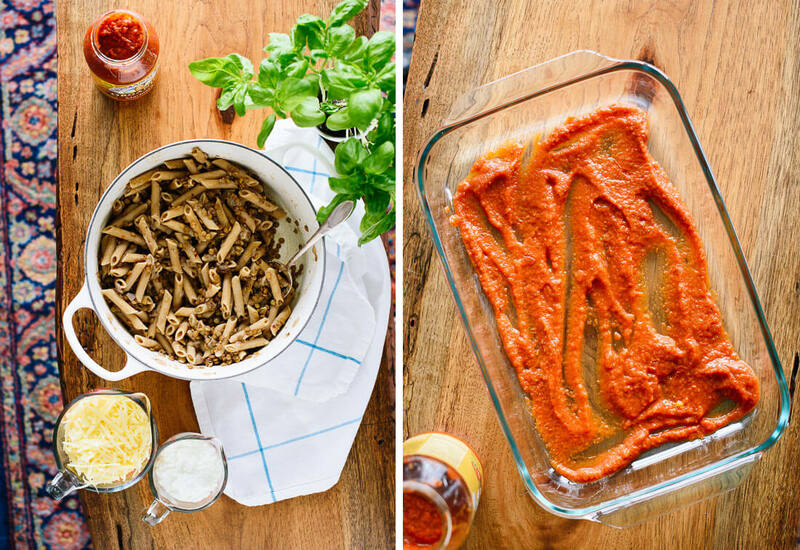 You’ve probably noticed that not all pre-made marinara sauces are created equally. My new go-to is my partner Newman’s Own organic marinara, which is thick and rich with slow-cooked tomato flavor. It’s hard to replicate that level of flavor at home without actually simmering tomatoes on the stovetop for hours. It’s organic, which is especially important for tomato products, since conventionally grown tomatoes tend to be high in pesticide residue. Their sauce is also sugar free, unlike so many of the other sauces that are dessert disguised as marinara. My childhood favorite lists sugar third on the ingredients list, right after the tomatoes. Last, but certainly not least—I love this brand because they donate 100 percent of profits to charity. Not 5 percent or 10 percent—all of it. Since 1982, the Newman’s Own Foundation has donated over $475 million to thousands of charities. I’m tremendously inspired by their business model and would love to see more companies do the same. Maybe I’ll start one of my own someday. 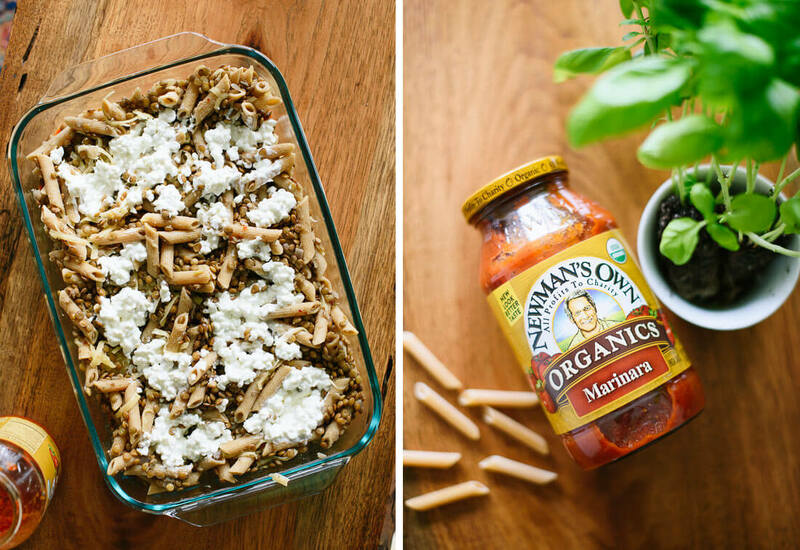 This healthy vegetarian baked ziti recipe includes lentils for protein. It’s a delicious dinner that makes great leftovers. Be sure to serve it with a big green side salad; my Italian chopped salad or a pared-down version of it would be perfect. Recipe yields 6 to 8 servings. To cook the lentils: In a large saucepan over medium heat, warm the olive oil until shimmering. Add the onion and salt. Cook, stirring occasionally, until the onion is turning translucent, about 4 to 5 minutes. Add the garlic and cook until fragrant, about 30 seconds. Add the lentils and water, and stir to combine. Raise the heat to high and bring the mixture to a simmer, then reduce heat to medium-low and gently simmer until the lentils are tender and cooked through, about 30 to 40 minutes. Drain the mixture well in a fine-mesh sieve and return the lentils to their pot. Set aside. Meanwhile, preheat the oven to 350 degrees Fahrenheit and bring a large pot of salted water to boil. Cook the pasta just until al dente, according to package directions. Drain and return the pasta to the pot. Add the lentils to the pasta. Add ½ cup of the cheese, reserving the rest for later. Season to taste with salt (I usually add ¼ to ½ teaspoon), freshly ground black pepper and red pepper flakes (if using). 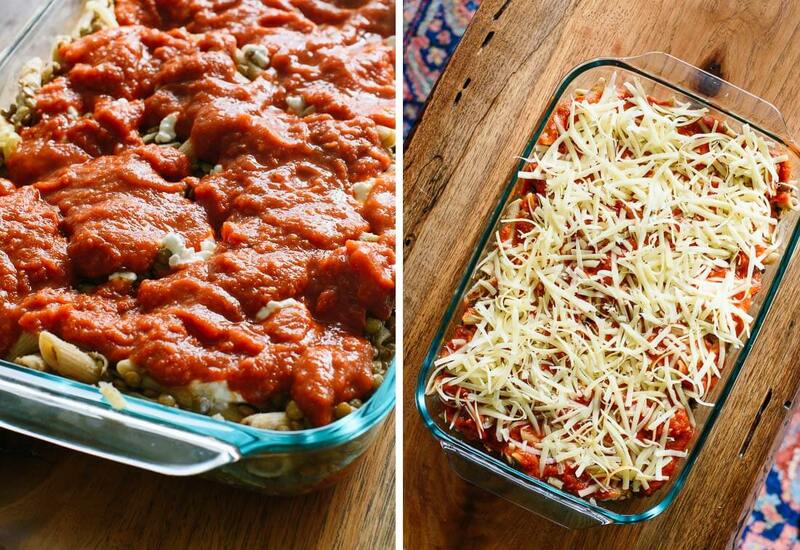 Pour 1 cup of the marinara sauce into a 13×9-inch baking dish. Spread the sauce around with a spatula so the base of the baker is evenly coated. Pour the lentil and pasta mixture into the baker and spread it so it’s evenly distributed. Using a spoon, dollop cottage cheese in big spoonfuls over the pasta, then just lightly swirl the mixture a bit so the cottage cheese is still concentrated in those areas. Drizzle the rest of the sauce evenly over the dish (adding extra sauce if you’d like) and gently spread it over the pasta. Sprinkle the remaining mozzarella evenly over the dish. Cover the baker tightly with aluminum foil—don’t let it touch the cheese—or stick a few wooden toothpicks down the center and place a generously sized piece of parchment paper, folded in the middle to make a “tent” over the baker. Bake for 30 minutes, then remove the covering, increase the heat to 450, and continue baking until the cheese on top is golden and spotty, 3 to 9 more minutes. Remove the baker from the oven and let it cool for 10 minutes before serving (trust me). Sprinkle freshly torn basil on top, slice and serve. *Lentil notes: If you want to use pre-cooked lentils to save a step (they won’t be as flavorful), you’ll need about 17 ounces or 3 ½ cups cooked lentils. **Cottage cheese vs. ricotta: I genuinely prefer cottage cheese to ricotta here, even though I can’t stand cottage cheese on its own. Ricotta tends to get gummy when heated, which bothers me, whereas cottage cheese turns magically more creamy and delicious. Use whichever one you prefer in lasagna recipes. 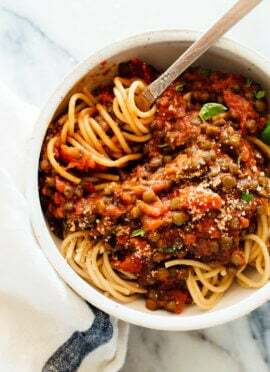 Change it up: You can add cooked bite-sized veggies or sautéed greens to the lentil and pasta mixture, if you’d like! Advance preparation: I believe you could make the lentils and pasta ahead of time, refrigerate, and assemble just before baking. Matter of fact, you could probably assemble the whole thing and refrigerate until baking. It’s probably a good candidate for freezing before baking, too. Please let me know if you try. This post was created in partnership with Newman’s Own and I received compensation for my participation. Opinions are my own, always. Thank you for supporting the sponsors who support C+K! Yum! 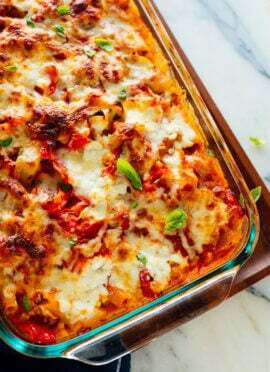 I was just thinking about making a baked pasta dish this weekend, since it is even cold down here in Florida, and ziti sounds perfect! Yes, I hear it’s getting chilly down South, too! But–at least we don’t have it as bad as the Northeast. I hope you try the ziti! This looks like it will be tonight’s dinner! Thanks Kate! I love recipes that will work well with my newly vegetarian daughter (8 yrs old). I also like the fact that the recipe calls for “Newman’s Own” sauce. Yes, thanks, Kim! I mentioned the company’s generosity in the post–I love that about them! I hope you try the dish. stay warm friend. its been chilly here too so baked ziti will be perfect remedy for that. Thank you! I’m thinking warm thoughts. I hope you like the ziti! Lentils and pasta are so good together, but I’ve never thought to bake lentils with pasta. This makes me think of the huge pans of mostaccioli I ate as a kid, but with a much better return on investment. It’s such a great combination. I think you’ll like it! can you please give me a nutrition list for this. I am on Weight Watchers and need to know the points and how much as far as cups I can eat. Hi, Judith–Unfortunately, I don’t have nutritional info available for my recipes just yet. I’m looking for a solution, and will update about it once I find one. Thanks! Trader Joe’s has a new lentil pasta – their black bean one is great too. Can’t wait to use it in this recipe! Oh, I’ll have to try it! Thanks for the tip, Nicole. Any idea of the nutritional breakdown of this dish? Looks like a lot of calories. Hi, Doris–Unfortunately, I don’t have nutritional info available for my recipes just yet. I’m looking for a solution, and will update about it once I find one. Thanks! 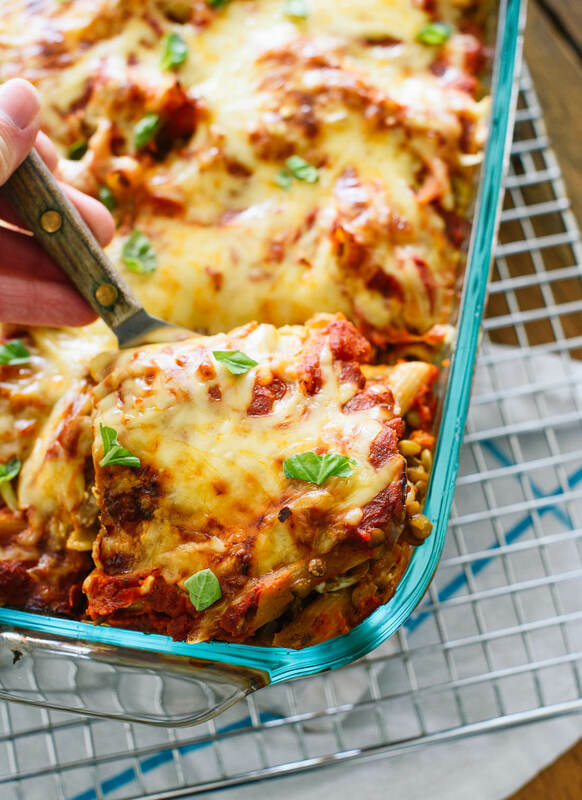 I love lentils, and pasta bakes, but have never put them together, great idea! I totally agree that cottage cheese is better, too. Thanks! You’re welcome, Alison! I hope you like it. Looks great! Any suggestions on a great vegan substitute for cottage cheese? Hi, Wendell– I haven’t tried it with this particular dish but you could use tofu in place of the cheese, like in this Minimalist Baker recipe. Let me know how it goes! Hi. Made this tonight and enjoyed the lentil/pasta combination. I had a box of pre-cooked lentils on hand so I used those, and then also defrosted and chopped in my blender a bag of roasted vegetables and added those as well. Very tasty and easy. Will make again and try adding in mushrooms. Thanks, Iris! Your version sounds great. I make something very similar but use dark red kidney beans and add chopped baby shower spinach. I agree, adding a protein like beans per lentils make the meal more substantial. It makes a big difference, and protein is always a great addition to keep you feeling full. Hi, this looks awesome! Can you use red or green lentils too? I think that’d work just fine, Jill! Can we make it vegan?? I think so, Mary! You could do a vegan ricotta in place of the cottage cheese, and some vegan shredded cheese in place of the mozzarella. This recipe from Minimalist Baker includes tofu ricotta, and you can find shredded non-dairy cheese at the store. Me, too! 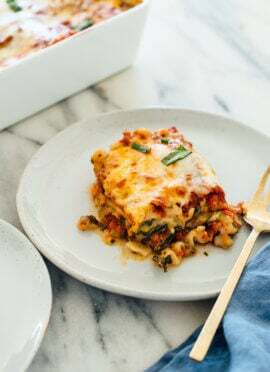 Pasta bakes are so fun to make and super hearty. Saw this recipe yesterday and made it last night. It was easy to throw together and the lentils added substance to the ziti. BF commented that he didn’t miss the meat. Next time, I’ll add some veggies as suggested. It’s a good base recipe and will definitely make again. Thanks, RF! Glad it was hearty enough for your guy, too. I am going to try it with Kite Hill ricotta and Myoko’s Creamery mozzarella, both pricey but this looks worth the splurge! Totally! I hope it works out well, Shirleen. Belated thank you for your comment, Maureen! So glad you enjoyed the casserole. I fixed the lentil baked ziti today. It was delicious. My husband who is suspicious of casseroles loved it. Who knew lentils were this versatile?Fortunately there is plenty left for tomorrow night. Laura, thank you! I’m so glad you both loved this one. I used mostly red lentils and probably would go with them completely next time, as they blend in better. Adding mushrooms and/or other vegetables could be interesting too. Be forewarned – this recipe probably makes 6-8 servings. Yes, this one is good for a crowd or meal prepping–there’s a lot. Mushrooms sound delicious with this, I’ll have to incorporate them next time! Thanks, Ana! Really glad to hear it! This was absolutely fantastic! Loved the surprise of the lentil texture it was SO satisfying! Can’t wait for the next recipe… thank you! You’re welcome, Cait! I love the heartiness of the lentils. Thank you, Mary Ella! Such kind words. I’m so glad to hear you love the blog! Baked this dish for dinner yesterday and it was delicious! My husband was hesitant of the lentils, but he loved the dish too! As a pregnant woman, I’ve been trying to include more lentils in my diet, and this was a great decision. Thank you! Made this for supper today and loved it! I substituted the Ziti with penne. Will definitely be making again. I did make this dish and it was delicious. Should have taken your suggestion of adding the additional cup of sauce, but will do that the next time. Also plan to add sautéed spinach and maybe some mushrooms as well. Used cottage cheese as suggested and it was quite nice. Will probably go with 1 1/2 cup of the next time. Used whole wheat penne for the pasta. All in all, both my beau and I loved this very simple dish and I will definitely make it again. Thanks for another great recipe. You’re welcome, Georgette! I’m so glad the two of you enjoyed it so much. I used 1 1/4 cup precooked lentils (from Trader Joes). It was SO delicious! My daughter, age 11, LOVES lentils so she gobbled this up for dinner and wants it for breakfast tomorrow morning, too :) She had a concert tonight so I baked it ahead of time and heated it up for a quick dinner with salad before we had to leave. Thank you for the recipe! Sounds quick and delicious, Emily! Kate – loved it! Sub’d organic sprouted tofu for the cottage cheese and used Trader Joe’s canned marinara sauce (no sugar). Didn’t think it was quite zesty enough though. So when reheating I poured about a half a cup of fresh homemade salsa on top and microwaved… Fabulous! Thx for another great recipe! Look forward to getting the cookbook. So glad that worked for you, Wendell! To the person doing Weight Watchers, I calculated the values and for an 8 serving dish it is 12 smart points, for 10 servings would 10 smart points. Made it tonight but haven’t tasted it yet- will be Sunday lunch tomorrow! Thank you, Lynne! So helpful. how come when i click print it goes to the recipe then nothing iv’e printed other reciepes from othersalls well but yours don’t print. Hi Susan, I’m sorry you had trouble with my website. I just clicked on the “print” icon next to the recipe title and it opened up a print-friendly version. You might select “print” in your browser but it should print well. This weekend I prepared the Lentil Baked Ziti. I thought it turned out yummy. I followed your directions closely, using the cottage cheese instead of the ricotta, adding the Paul Newman’s Organic Marinara and plenty of basil. I do think that the next time I prepare this recipe I will add some vegetable, either broccoli or cauliflower, but it doesn’t require it. I even divided the recipe and used two smaller foil dishes so it would fit into my toaster oven side by side, and it cooked perfectly. Thank you so much for your beautiful food photography and easy-to-follow recipes. Thanks, Debbie! Some extra veg in here sounds delicious. Kate, this was easy to make and delicious! I love that I was able to work protein-packed lentils into a baked pasta dish, especially for my vegetarian, teenage daughter. I used a full pound of DeLallo whole wheat pasta & just increased the sauce & cheeses a little bit. It was a big hit with my whole family and I am going to make it again for a birthday party next weekend. Thank you for your thoughtful, delicious recipes. I can’t wait to receive your new cookbook (I’ve already ordered it)! I have this going in oven now and it smells so good! I added baby spinach when I mixed the pasta and lentils and let it wilt down. 301 calories, 8 grams of fat, 45 grams of carbs, 12 grams of fiber, 8 grams of sugar, and 21 grams of protein. It wins my vote for healthy, protein packed, whole food eating. Thank you so much! Thanks, Elizabeth! I’m sure this will be helpful for many other readers. We love this recipe too! Terrific use of lentils for us pasta people, thank you!! I made this the other day and it was delicious and so filling! I love pasta but it usually doesn’t fill me up…this totally did. My husband and toddler son loved it too! I assembled everything the night before and then baked it when I got home from work the next day. Will definitely make this again- so tasty! Thank you! Excellent! I’m so glad this fit the bill for you– easy to prep, and filling to boot! Thanks, Alison. Made the lentil baked ziti last night. Delicious! Even my meat-eating son-in-law loved it. Great! So glad everyone enjoyed it, Nancy. Loved the baked lentil ziti. I used penne, cottage cheese and pinch of cayenne instead of chilli flakes. Used Paul Newman’s bolognese because couldn’t get the organic in Oz. Also added fresh oregano in lentils. All very delicious. My Vego teen son also thought so. Will make this one again. I’m so glad everyone enjoyed this, Susan! If I were to freeze this, what would be your suggestions for thawing & cooking? Thaw overnight and cook according to your directions? Thanks in advance! My family loved this! We cooked it a couple of weeks ago and it was a favorite. I’d like to drop this by a friend’s house Uncooked, so they can choose to either bake it or freeze it :) let me know any suggestions, I want them to love it! Hi Kelci, I’m sorry for the slow response! I just consulted some pages on lasagna freezing tips. I think you could freeze it whole and thaw overnight before baking, yes. I’d assume the same amount of time; possibly a little longer. Another option would be to bake it and let them enjoy leftovers or freeze individual servings, which could be popped into the microwave for a meal in a hurry. I was hesitant to try this, as I make several other baked pasta dishes that are similar. BUT I am so glad I did. The lentils added so much flavor and “meatiness” to the dish. I will probably always add lentils from now on! Awesome! So glad to hear this, Beth. Yum! My favorite thing about being an adult is that every food is potential breakfast food. Thanks, Tierney! Made this this week. Everyone loved it! Very yummy and hearty! Made this tonight for dinner with seasoned lentils (forgot to get an onion so I just used onion powder, garlic powder, salt/pepper, basil, and red pepper flakes) and cottage cheese. Easy, delicious, hearty, the lentils make you forget it’s meat-free. Yes, I love the lentil’s meatiness in this dish, too! Thanks so much, Kayla. I made this tonight and loved it! And, I assembled beforehand and refrigerated until dinnertime. Worked great! I was too lazy to make a salad to go with it so I sauteed a bunch of spinach and added it to the casserole. Thanks for another great recipe! Put the salad in the pasta! Perfect compromise. Thanks, Sally! Wow is all I can say! My daughter is vegetarian so I have been looking for recipes that the whole family can enjoy and found this one. It is absolutely delicious! Although I love lentils, I honestly wasn’t sure how they would taste in baked ziti. Well they are the perfect additional ingredient. And I definitely agree with the note about the cottage cheese vs. ricotta. I am also not a cottage cheese fan and I could not tell that there was any in this dish. This will be a dinner we will be having many times in the future. And if you serve the Vegetarian Chopped Salad beforehand as I did, you can’t go wrong. YES, that sounds like the perfect pairing, Diane. I’m so glad this exceeded your expectations! Are you Italian. Even if you are not, your food ideas and recipes are very good. I have been a vegetarian for the past 70 years. Before then I ate meatballs. Once in awhile I do grab a meatball in honor of my mother. I’m not, but sometimes I wish I were! :) Glad to hear you’re enjoying my recipes and eating well, Pat! This was super good! I made it for dinner guests who might normally shy away from vegetarian food, and they raved about it. I used gluten free pasta and threw in some leftover roasted mixed veggies. This will go on the keeper list. A belated thank you for this recipe, which I have made many times since you first posted it. I sometimes freeze individual portions after cooking, to have on hand for those days when I really don’t feel like doing anything more than popping something in the microwave. I’ve also added veggies like broccoli, which works well. Thanks! You’re welcome, Cynthia! And you’re right: this one re-heats great. Do you have calorie counts that I am missing? Trying to lose weight and that would certainly help. Thanks so much all these recipes look incredible. Hi, Patricia. Unfortunately, I don’t have nutritional info available for my recipes just yet. I’m looking for a solution, and will update about it once I find one. In the meantime, here’s a nutrition calculator that might come in handy. Amazing! 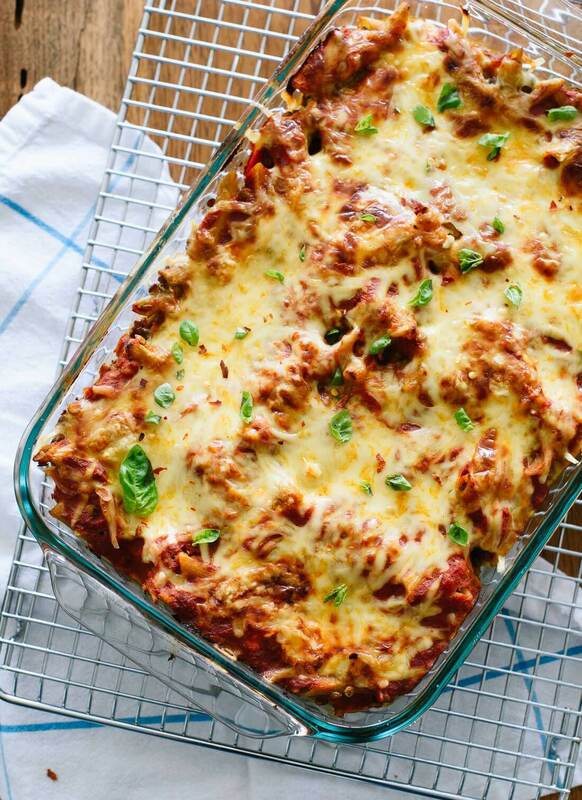 I honestly like this better than traditional baked ziti or lasagna! My 17 and 21 year old picky eaters devoured it. I almost didn’t make it because the thought of lentils in my pasta was a little scary. You’d never know they were there unless someone told you! Thank you for making the transition to vegetarian eating fun and delicious. Yes, the lentils blend in nicely and add a really great, hearty texture. I’m so glad everyone enjoyed it, Sherry! This was a good basic recipe and I think the lentils added a nice heartiness. I also added a zucchini (cut into matchsticks) and was glad I did. I gave it 4 stars instead of 5 because I didn’t find it quite as good as some of the other recipes on this site… Kate has set a high bar for herself! Thanks for the notes, Annabelle! I would love to see calorie counts for your recipes – love them but it helps me be more aware of intake. Hi, Joyce. Unfortunately, I don’t have nutritional info available for my recipes just yet. I’m looking for a solution, and will update about it once I find one. In the meantime, here’s a nutrition calculator that might come in handy. Another alternative for ricotta is crumbled tofu. We often use 1/2 ricotta and 1/2 tofu. It adds protein and cuts back on the amount of cheese in dishes such as this, making them a bit lighter. I made this for my parents and we all enjoyed it. I’ve been trying to find vegetarian dishes that are substantial and filling. I used pasta made from pulses for even more protein. This is the second “keeper” recipe I’ve so far tried from your site. I also love the vegan lentil soup. Thanks so much! I’m looking forward to trying more of your recipes. That sounds delicious, Mandy! I love lentil and garbanzo bean pastas, too– it’s a great idea to use them in this dish. Soooooo, let me start with.. My Husband Loves Your Recipes!!!! I mean, there is a literal twinkle in his eye when I say I’m making something from your blog…. I just made this one! For a working Mom, I have to say, this is a great recipe that I can easily prepare while everyone is getting home from work/school and I don’t feel like I am held captive in the kitchen. Plus when dinner was over, I got to bask in the never ending compliments of my (…clears throat…I mean, your) culinary excellence!!! I added two bags of frozen veggies (perfect hiding place) and mixed in some ricotta with the cottage cheese. Thank you so much for the wonderful recipes. You are truly my go to for great dinners! I wish you much more love. happiness. and joy! You’re right, this is a great recipe for hiding extra veggies and greens! I’m so glad your family adored it–and you best bask in that glory, that is all yours! Made this with a different brand of tomato sauce, but otherwise followed the recipe. When I tasted the whole wheat penne right out of the pot, it had a distinct cardboard aftertaste, but it wasn’t noticeable in the final product. Maybe Newman’s own has more spices than the tomato sauce I used, but I thought a bit of oregano wouldn’t have been amiss here. It received calmly favorable reviews from my test subjects. Thanks, MacFadden! Which brand of whole wheat pasta did you use? Some are way better than others. I recommend DeLallo brand—it definitely doesn’t taste like cardboard, or noticeably different from regular pasta, really. Loved this recipe and all of the recipes I’ve tried from this site! Thank you! Great Dish! My picky toddler and picky 6 year old love it! I might half the recipe next time…we’ve had plenty of leftovers and there’s still a lot left. I’m new to vegetarian dishes and have been eatin’ up your recipes the last couple weeks! Honestly I was always hesitant to try vegetarian dishes because they seem so bland, but not one of your recipes have failed me. THANKS! Made this tonight and it was delicious! I made one small tweak to the recipe, I added fennel seed to the lentils when cooking (something I discovered when making lentil meatballs).This will be added to our favorites! Do you think brown rice pasta will work, rather than the whole wheat pasta? I didn’t have any ricotta nor tomato sauce, so I substituted with blobs of crème fraîche and tinned tomatoes. It was utterly delicious. Really easy to make, too. This is definitely a go-to for the next dinner party. Great to hear Chilli! Thank you for sharing. I’ve made this a few times now. I’ve never been able to find the Newman’s organic marinara ( maybe it’s not sold in Australia), so have substituted. It’s quite tomatoey in flavor, but when served with a fresh salad as Kate suggests, it’s great. Thank you, Kathy for another review :) I appreciate it! My wife and I really enjoyed this dish. A great way to use lentils. I’ll probably add mushrooms next time. Thanks. Sounds like a wonderful addition! Thanks, Dennis for your review. We cooked this last night and it was delicious! On advice, added sauted fresh spinach (3 cups) and 1 cup mushrooms. Used French green lentils, which hold their shape and have a slightly nuttier taste. Added a pinch of red pepper flakes and next time will add more. Used a 10 x 10 baking dish instead of a 9 x 13 and it turned out great. The texture and flavor of this dish is wonderful. Highly recommend. Thanks, Carey for sharing! It’s fun to hear the approaches you take. I appreciate the review! Could I use red lentils and yellow onion? 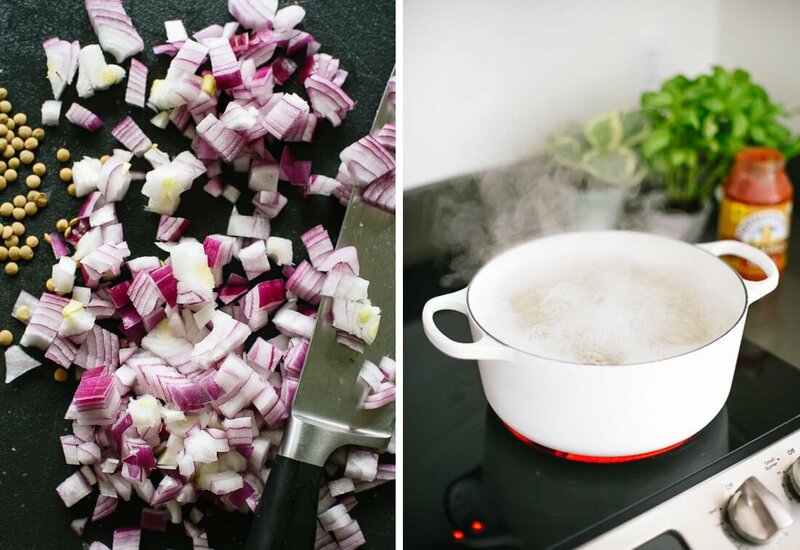 Sure, you can use a yellow onion. However, I would not recommend red lentils. They don’t seem to standup as well and can become mushy quickly. This looks great!! I have green lentils, do you think they would work in this? You can, but they can become more tender. Just keep that in mind with the cooking time. Enjoy! My family loved this dish, great flavor and filling. I used cottage cheese. Is your nutrition information for the ricotta cheese or cottage cheese? This is a regular in my house. Once or twice a week, I try to make something that will provide yummy leftovers so I can go to an evening yoga class and have a quick dinner ready for my family. This is in the rotation. Just made this – really yummy. Second best thing — there are leftovers for tomorrow. This is by far my favorite baked pasta dish. We use Russian farm cheese instead of ricotta/cottage cheese and it is absolutely delicious. I usually make the whole thing while my son naps during the weekend, pop it in the fridge and it is ready to go once we get home from whatever we are doing that day and it turns out great. I’ve also made this and froze it to give to new Mamas around the neighborhood and have been told it goes from freezer to oven just fine. Hi, Kelly! What a delicious thing to have prepared for the week. I’m so thrilled to hear you enjoy it and share it as well. Thank you so much for the review! Hi, Sarah! That sounds delicious. I’m so glad you loved it. Thanks for the comment and star review! I made this last night for my husband and me. We loved it! I made the sauce in the Instant Pot Sunday morning to save a step. We loved it because the lentils were so plentiful and the recipe makes so much! I think I will add another cup of sauce into it though – we discovered we like our ziti extra sauce-y. Thanks Cookie and Kate for another great recipe! You’re welcome, Emily! How long did you set the time in your instapot? I know a lot of readers ask about instapot directions. Thanks for sharing! Hi – I only used the Instant Pot for the marinara sauce, from a recipe in an IP cookbook. I think the sauce takes 30 minutes. My husband and I loved this dish, it’s a perfect vegetarian alternative! I made half the recipe and have left-overs for another dinner. Made this last night and went down a treat! Substituted Newman’s Mariniara sauce with passata as I don’t think I can get it here in England. Added a little baking soda to take the tartness out of the tomato, as well as baby spinach and diced carrot to get those important veggies but only used 2 cups of precooked brown french lentils as it was all I had. Think it needed more as recommended above. Will bake again. Thank you! Wonderful, Barbara! Thank you for your review. I’m glad you will make it again. Just wanted to say … your blog is the best! I’ve been a vegetarian for about 10 years and hands down this is the best site I have ever come across. I basically love every single recipe. I cook a lot and I love how all of the recipes are intuitive and not super hard or made up of crazy impossible to find ingredients. It’s just damn good healthy vegetarian cooking. Keep up the good work. Your blog is my single go-to these days for all my recipes. All the best. You’re sweet, Liz! Thank you so much. I put a lot of time into it, that’s for sure. Great! I would love to hear what you think, Amit, when you give it a try. Made this last night, and it is great re-warmed in lunches! Yum! Thank you for sharing the recipe. You’re welcome, Sara! Thanks for your comment and review. Can I use red lentils instead? I wouldn’t recommend it as they aren’t quite the same consistency when cooked and can get mushy quickly. I had lentils once as a child and found them foul, but my vegan brother came to visit and I made this dish (with cashew cheese) because he eats lentils every day and I wanted to make something he liked. That was two days ago and now I’m making this dish again for myself – it was so ridiculously good. Thank you Kate!!! Hooray! I’m glad you love it. 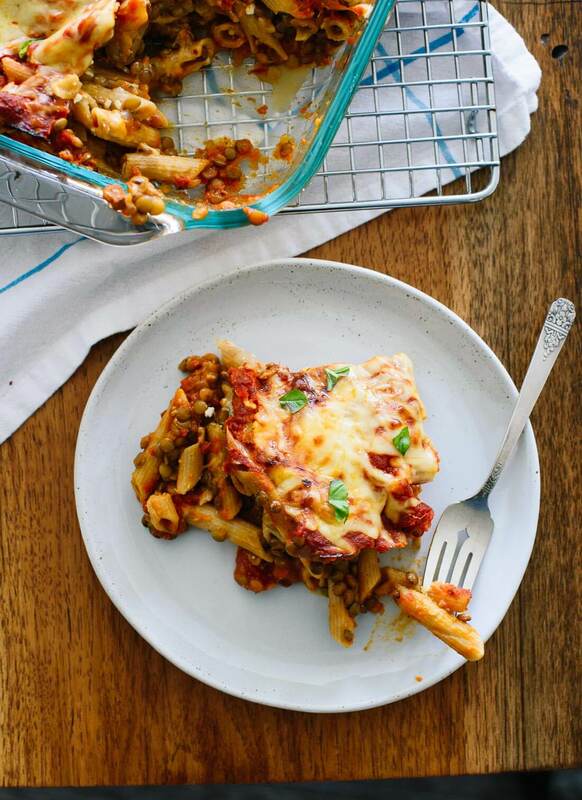 We love the Lentil Baked Ziti dish especially in the winter, but it is a lot of food for me and my husband so I started to use ramekins instead of one big baking dish. So I can freeze them and take out as many portions as needed and it makes for a delicious and easy weeknight dinner. That sounds like a great idea! Thanks for sharing. It was delish! Substituted vegan mozzarella cheese for regular and made vegan ricotta cheese! Also added mushrooms and fresh spinach to the lentils! Sounds delicious! Thanks for your review. Could you top this with a fried egg or would that be too much? Thank you! Just made this! My husband’s mom is Italian so it had a lot to live up to, but we loved it! I think if/when I make it again, I’ll reduce the pasta and increase the amount of lentils. I had a bite of lentil mix before mixing it in, and I really loved that by itself too–I think I might start making it as a simple lunch to pack for work. Just a note–the recipe says to add half a cup of “the cheese” into the pasta/lentil mix, and I wasn’t sure if you meant the mozzarella or the cottage/ricotta. I put the ricotta in. I’m glad it passed the test! See step 5 of what to do with the cottage cheese. Sorry it was a little confusing! Another winner! I actually combined two of your recipes for this one. I used your spinach-cheese mixture from your Roasted Eggplant Lasagne recipe in your cookbook to dollop over the lentils and pasta since I had a bunch of spinach to use up. Absolutely delicious. I switched to a vegetarian lifestyle and your blog and cookbook have been a lifesaver. Haven’t missed meat yet. I have your Lemony Almond-Blueberry Cake in the oven now. The house smells wonderful. Thank you. Oh that sounds like a great idea and delicious! I love the creativity! Just made this last night and wanted to let you know it was delicious! Such perfect cold weather comfort food :) Warm and hearty and filling. The best part is all the leftovers.. I already had it again for lunch today with even more marinara dumped on top because I also like saucy ziti! A couple of weeks ago a coworker and I started a lunch swap. One week I make our lunches, she makes lunch the next week. It’s great, as I stink at consistent meal prep. This way I only have to prep every other week. She is not a vegetarian, so everyone at work told she is brave taking me on!! I wanted to make sure she did not bail our first week, so I tried to find something very filling and not a bland salad. This is amazing!! It make very large servings, keeps well and heats up great! Many folks at work were, rightfully, jealous. I will definitely make this again! That is a fun idea, Cindy! Thanks for sharing that idea and how much you loved this recipe. I appreciate the review. This recipe is delicious! I prepared the lentils and pasta portion the night before and mixed them together with the cheese so it would be a quick assembly the next day. It turned out great! The bites with the cottage cheese are my favorite. Which cheese did you mean in step 4? The mozzarella or cottage? Everything about this recipe is absolutely wonderful! The aroma while cooking is heavenly and the finished dish is out-of-this-world!! I’m so glad I bought your cookbook- it’s the best one I’ve ever had. Thank you for sharing, Karyn! I’m glad you love it. This is so yummy. I used pasta with extra protein, and added bell peppers and zucchini. It is very ooey and gooey because of the cheeses. I made a huge batch and will be eating it all week! Thank you for sharing, Sherri!